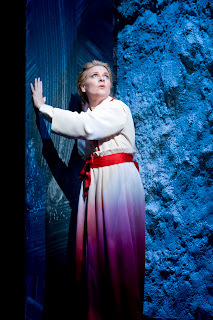 Before our final two performances, I wanted to check in with our Isolde, Swedish soprano Annalena Persson, who is making her US opera debut with these seven performances of one opera’s most challenging roles. First, Annalena, for those of us who aren’t great with Swedish, what’s the correct pronunciation of your name? an-ah-LAY-nah PEAR-shawn. Like the fruit. How many times have you sung Isolde now? Oh, I’ll have done around 40 performances, when the Seattle production closes. You’ve also sung Senta and Sieglinde and a couple of Strauss roles. Do you sing Italian music, too? 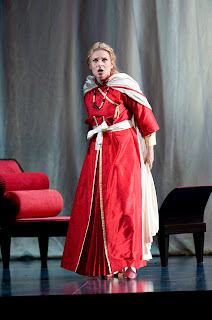 I’m just about to sing my first Verdi role, Elisabetta in Don Carlo, back home [in Göteborg/Gothenburg, Sweden]. And I certainly hope it isn’t my last! I’d love to sing Lady Macbeth, or Amelia in Un ballo in maschera. I did in fact sing Turandot, which I liked very much, it was fun, but I didn’t make a big deal of it because if you’re young and you sing Isolde and Turandot, they just keep asking you sing bigger, heavier stuff, you know, Brünnhilde and so on. If you sing Turandot they won’t ask you for Tosca, which I’d very much like to sing. 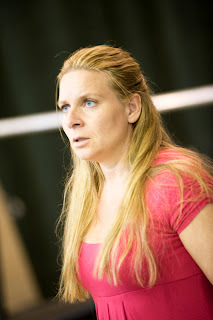 Also Minnie, in La fanciulla del West. What about modern music? Do you sing in English? Or Swedish? I haven’t sung in English. 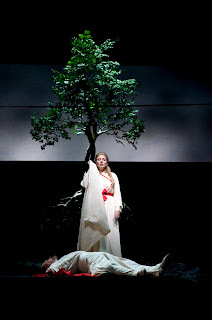 We did a Swedish opera recently, I think it was composed in the 1990s, about Queen Christina of Sweden. It was two acts; in the first act she was a child, it was about how she was treated, and then I played her in the second act, when she was older, and I got to play a mad scene. That was great, to sing in Swedish when it was the original language. You know, I’m not a friend of singing Marriage of Figaro in Swedish. Getting back to Isolde, how do you pace yourself, when you have to sing one of the most challenging and exhausting roles ever written? I don’t have any crazy rituals that I have to do. I usually take a long walk in the morning, eat my breakfast, maybe go to the grocery store, just try and relax. I start to stretch my body a little about three hours before the performance, as you would when you’re going for a really long run. That’s when you begin feeling what’s going on with the body, what kind of evening it will be. At the theater, I tend to talk to people backstage, share funny stories, you know—in my mind I’m already in the performance. Talking to people is a way of not getting nervous, part of my concentration, actually. For Isolde, the opening scene is the real warmup. It’s a crazy beginning, she uses the whole vocal register in her first couple of pages. That’s also the moment when you understand how you’ll have to treat your voice tonight. And it just builds from there. All Isoldes say the same thing: you can’t really warm up. If you want to sing the opening perfectly [her tremendous curse on the ship] you’d have to warm up for thirty minutes. But it’s the whole evening that counts, and you’ll need all that voice later on. The nice thing about such a long part is that if you aren’t perfect in the opening, you can make up for it later. I think the beginning of Isolde is the hardest opening in all of opera. Brünnhilde makes a well-known entrance in Act Two of Die Walküre [the “Hojotoho”], but it’s also the only thing that everybody’s expecting from that singer. With Isolde, the thing that people know is the end, the “Liebestod,” so that’s what you have to build to. 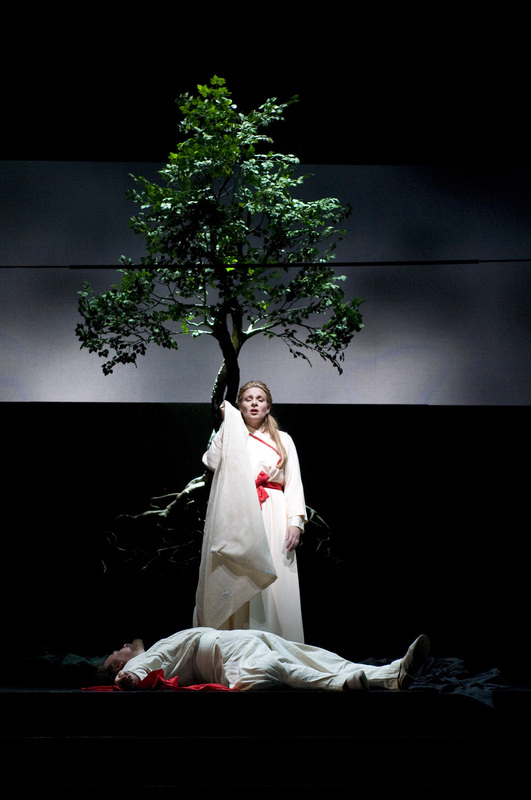 How does Isolde change over the course of the opera? She goes through a whole life in one evening. I see Isolde at the beginning as a young, angry girl. She has to grow so much, go so far with herself, that in the end there’s no problem for her to die for love. When the “Liebestod” comes, it’s not a hard thing for Isolde to go into Tristan’s world, in fact it’s the most normal thing for her to do. I think she’s really very very happy in the end, the first time she’s calm and totally relaxed about everything: finally we’re here. It’s not in life, it’s in death, but the love is bigger, so it doesn’t matter where they are. How’s this production been different for you from others you’ve done? The biggest difference is how the potion works, that they drink the death-potion in Act One. I’ve been thinking a great deal about it, and in a funny way it’s helped me understand what we were doing in other productions. I didn’t understand at the time, but that’s a little bit how we were playing it. I’ve had good luck in doing productions that are true to the words. If a production is true to the story, I must say, that’s when the opera becomes beautiful for me. The opera was meant to be beautiful. What’s been your favorite Seattle adventure so far? When I’m not at work I’ve spent a lot of time at Greenlake. I like to run, and I love going there. My daughter has been here with me, and Woodland Park Zoo—she wanted to go to the zoo again and again. And the Children’s Museum, what a wonderful place. And how she enjoyed the Duck Tour! She just loved it, screaming and dancing along! Seattle is a wonderful place for parents and children. I would like to be a mom here. Thanks for an interesting and informative interview!! If Fru Persson and her daughter love Seattle, Greenlake and the Zoo soooo much, then I hope Speight will bring them back a.s.a.p. If Annalena would love to do Minnie and/or Tosca that would be great!! Or any other suitable role. She and Asher can bring things to a high musical level worthy of Seattle!!! And, I also like productions where the action on stage mirrors the text; thanks Annalena, for making that important point!!! And, thanks, Jon for doing such a great job of letting audiences know what that text is -- in a language they all understand!!!!! !